Like many military spouses, I often don’t make enough time in my schedule throughout the week to properly prepare a healthy dinner every night. With that said, I do keep a few staples on hand to help ensure that there will be something to put on the table for dinner. Don’t worry if you aren’t able make dinner, your spouse can easily make dishes with these ingredients as well. These are foolproof recipes. 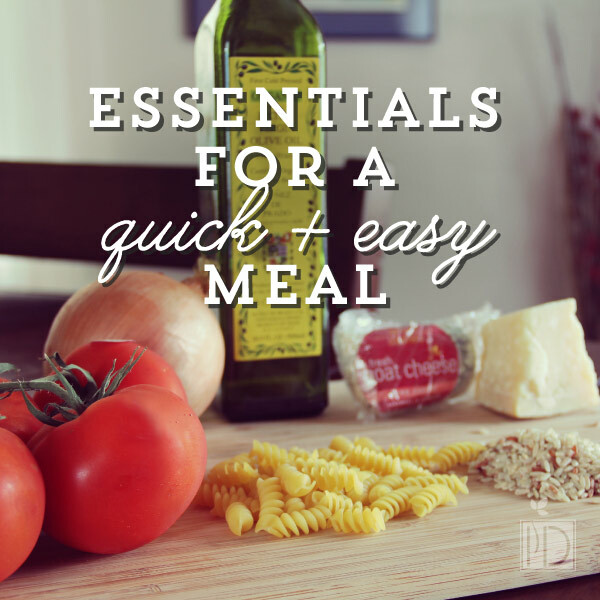 For pasta dishes you can use your favorite pasta or change up the recipes and use different types of pasta. Simply cook the orzo as recommended on the box for the amount you want in your pasta salad. After it is cooked, then drain it and add to a medium bowl. Allow time to chill if you like cold pasta salads or you can serve this dish a little warm. Next cube the onion, tomato, and some zucchini and add it to the orzo. Then crumble the feta and add olive oil, salt, and pepper to taste. The recipe is as simple as that. Cook pasta (bow tie, penne, elbow) as directed on the package, drain, and place into a baking dish Make sure the dish is big enough to add veggies later. Sauté the onions and your choice of zucchini or spinach until tender. Cube the tomatoes and add all the veggies to the pasta in the baking dish. Next add your choice of cheese if desired. I like using a mixture of goat cheese, feta, and Parmesan. Don’t add too much, just enough to help hold everything together. Sprinkle a little of the cheese on top to help give the dish a finished topping. One of the easiest recipes that my husband and I love eating is this dish. All you simply do is find packaged tortellini in the cold section of your grocery store. Cook as directed. Instead of using a heavy tomato sauce, try some olive oil instead. Simply drizzle a little of really delicious olive oil over the cooked pasta and then sprinkle with salt and pepper. Sometimes I also enjoy adding feta crumbles over the dish for a little more cheese. You can use cheese or meat filled tortellini depending on your preference. Cook as much rice as you desire as directed on the box. Simply sauté onions, bell peppers (use different colors for a pretty plate), and jalapeños until tender. Serve with rice and you are good to go. If you don’t have any rice on hand then try this with a regular potato or a sweet potato. Cut onion, carrots, cabbage, or snow peas into thin slices. Add a little bit of freshly grated garlic and then sauté them over low/medium heat. I like adding a squeeze of orange or a little orange juice to the mixture. Serve the sautéed veggies over the rice and you have a little taste of the Pacific on your plate. In another pan, combine the black beans, diced onion, tomato and jalapeños (more or less depending on taste). Heat this mixture until warm. Serve over rice and add cheddar cheese if desired. For a different take on this dish, you can place the rice in a baking dish, add the veggies, and then sprinkle with cheese and bake. This is also a good one that you can substitute a potato for the rice. This is a super simple salad and also adds great color to a party. Cube a few tomatoes, onions, and cucumbers and place them in a large bowl. Then add about a cup of olive oil to the bowl. Add more to taste. Next crumble and add about a medium cube of feta cheese, stirring in gently. Finally sprinkle with salt and pepper to taste. This is great to serve at family dinners or to make just for one. I can’t help myself from eating this with fresh bread. I love breakfast foods for dinner. One of my favorites is an omelet. Since I usually have tomatoes and onions on hand I usually add them as well. Other ingredients that make this a delicious meal are goat cheese and spinach. The creaminess of the cheese mixed with the flavors of spinach, tomato, and onion is melt-in-your-mouth good. There are tons more options that you can make with just staple ingredients. These are the ones that I usually have on hand, so therefore end up using. I have somehow managed to mix and match these ingredients to give a different taste to each meal. What are some of your favorite simple recipes? What is your go-to meal for when you don’t have much time?